For a decorated and recently retired K9 officer from the Elk Grove Police Department, the last week and a half have been something of a whirlwind of appearances recognizing his bravery in the line of duty. 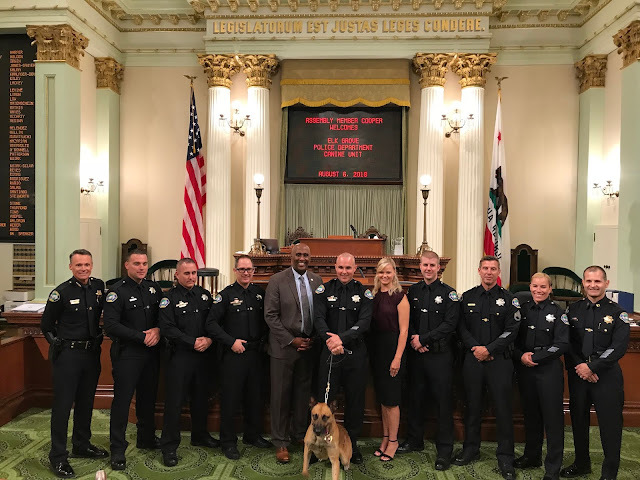 Recently retired from active service, K9 officer Blu was recognized today at a special ceremony with an Assembly Resolution as the California State Capitol by Assemblymember Jim Cooper (D - Elk Grove). Blu retired from active service with his partner, Elk Grove Police officer Jason Miller following injuries sustained after being shot while he was actively pursuing two criminal. Blu was shot twice in the leg, and after being nursed back to health, it was decided the rigors of duty warranted retirement. On January 7, 2017, EGPD Officer Miller and K9 Officer Blu observed a pair of armed and dangerous individuals fleeing the scene of a robbery in Elk Grove, at which time Officer Miller deployed K9 Blu to stop the criminals. Blu attempted to apprehend the victims and was suffered two gunshot wounds. Police later apprehended the criminal and K9 Blu was treated for his injuries by veterinary staff at VCA Bradshaw. Blu eventually returned to work after a one-month recovery, but later retired due to injuries sustained during the pursuit. On March 23, 2018, a Sacramento Superior Court judge sentenced Luther Foster, 46, of Sacramento to 25 years to life on charges of attempted murder, robbery, and harming a police K9. Before today's capitol appearance, Blu was also awarded the Purple Heart in a ceremony at Elk Grove City Hall on Friday, July 27. Along with Blu and Officer Miller, also in attending today's ceremony was Miller's wife Kacey Miller, Elk Grove Police Chief Bryan Noblett, and Elk Grove Police K9 Unit Officers.